This time of the year usually is warmer and the Roses would be in full bloom, I guess I will have to wait a bit more. In the meantime I am reminded that there are so many other plants which are now stealing the show and some of them do it in a way which is more subtle than just big wonderful blooms. Often we overlook fantastic foliage which accompanies the flowers. How about this novel idea, a plant which the foliage is just as much the star if not more, a tall order I would say! 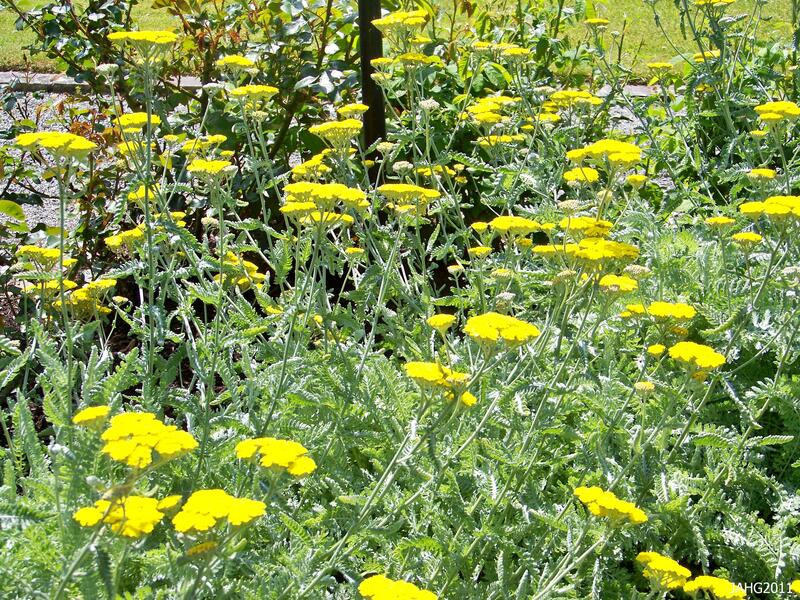 One plant I and many other gardeners would nominate is Achillea ‘Moonshine’ (Moonshine Yarrow). 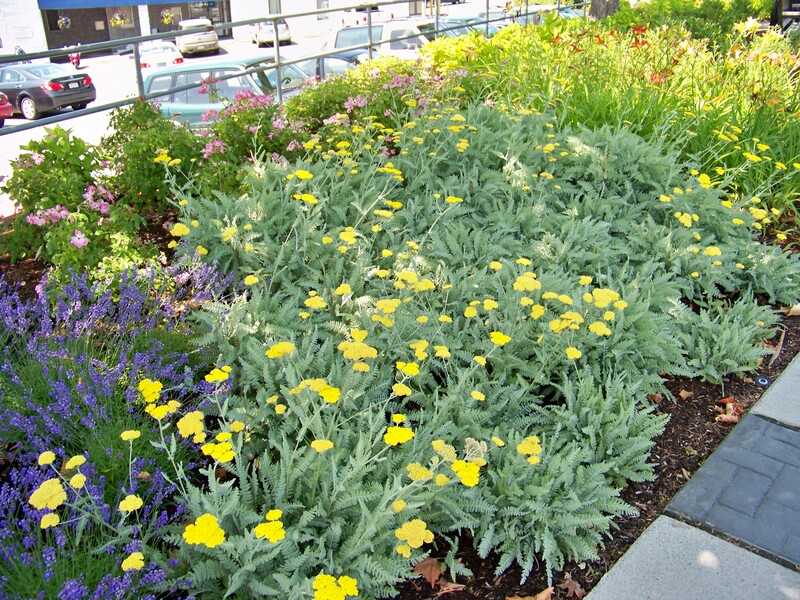 Achillea 'Moonshine is part of the street plantings in Brentwood Bay and looks good year round, tidy foliage and bright non-fading flowers. Achillea ‘Moonshine’ comes from the famous plantsman Alan Bloom(1906-2005) and Bressingham Gardens. If you look through perennial plant books you will see the name Alan Bloom and Bressingham Gardens mentions many times. Alan Bloom came from a plant family, his father grew cut flowers and fruit for a living . Alan left school to go into the business, his wise father said he should try as many areas as possible to find where his interest were and he settled on hardy perennials. After working as an apprentice Alan started his first wholesale perennial nursery in Oakington, the place of his birth. It took only 4 years for Blooms nursery to become the biggest of its kind in England. In 1946 he purchased the Bressingham Hall (near Diss in Norfolk) which included 228 acres of land. He began developing it during the 1950s and early 60s, during this time he also introduced nearly 200 newly named plant selections and hybrids which originated from his nursery and the famous gardens. The golden flowers and silver foliage of Achillea "Moonshine" is bright and soft at the same time making it an easy plant to work into garden designs. 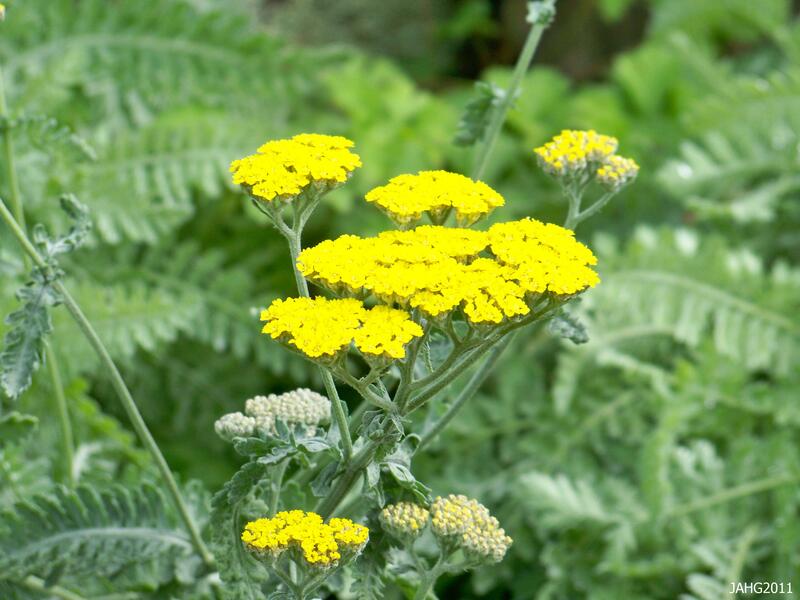 ‘Moonshine’ Yarrow is a cross between A. clypeolata (silvery foliage ,strong chrome yellow flowers) and taygetea( ferny foliage and creamy yellow flowers). It was discovered as a seedling around 1950 and introduced into gardens about 1954. 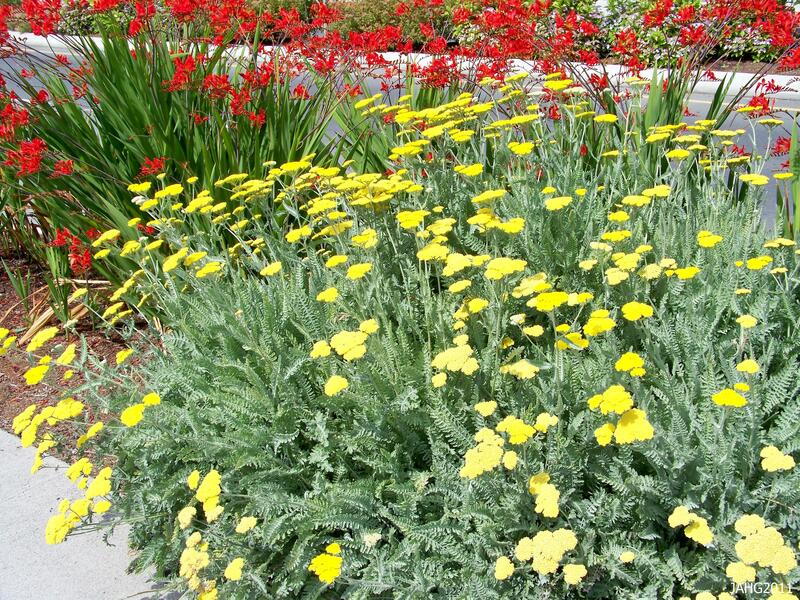 It was quickly recognized to be an outstanding plant and was awarded an A.G.M. (Award of Garden Merit) from the Royal Horticultural Society. The plant has proved to be one of the best ‘Blooms’ introductions and is seen in many situations from well maintained gardens to the tough street side planting. The silvery foliage of Achillea 'Moonshine combines the delicate 'ferniness' of A.taygetea with the silver sturdiness of A. clypeolata. I first encountered Achillea ‘Moonshine’ a the wholesale perennial nursery I worked at in the early 1990s and I knew at once that this was a great plant compared to the other Yarrows which were grown there at the time. The foliage was beautiful by its self and the slightly creamy yellow flowers seemed to bloom for the longest time. These plant were always quickly bought up by the local nurseries, landscape architects and designers who put in orders or came to visit the nursery to see the plant stock we had there. Here Achillea 'Moonshine' is used as a way to hide unsightly Rose stems along the exterior of the Rose Garden at Government House in Victoria. Achillea ‘Moonshine’ is an easy to grow plant which tolerate a good amount of neglect which makes it a very versatile plant for use in many situations. It does require full sun to produce the silveriest foliage and the most golden flowers, but, this is little to ask for such a grand reward! It takes most kinds of soil as long as its well-drained as wet feet can lead to trouble for most Achilleas. It is a fairly compact plant growing 60 cm. (2 ft.) high by about the same wide. Keeping it slightly under-watered will keep the floral stems from sprawling.Cut it back after its first flowering for it to repeat later in the summer. Divide it every couple of years to keep it vigorous. Achillea 'Moonshine' is excellent as cut or dried flowers and will continue to give pleasure long after other flowers are spent. 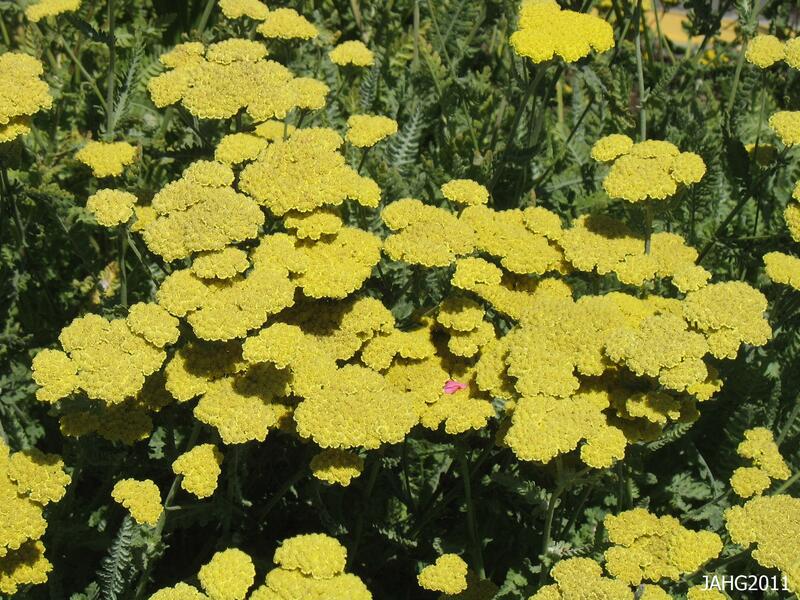 Achillea ‘Moonshine’ is hardy to -30 c.(-20 f.) and takes wet climates well as long as the soil is well drained. In the hotter areas it is said that the plant melts out in full sun conditions but I can find no explanation as to what this means. I might assume it is better to give it richer soil(moisture retaining) in those areas. 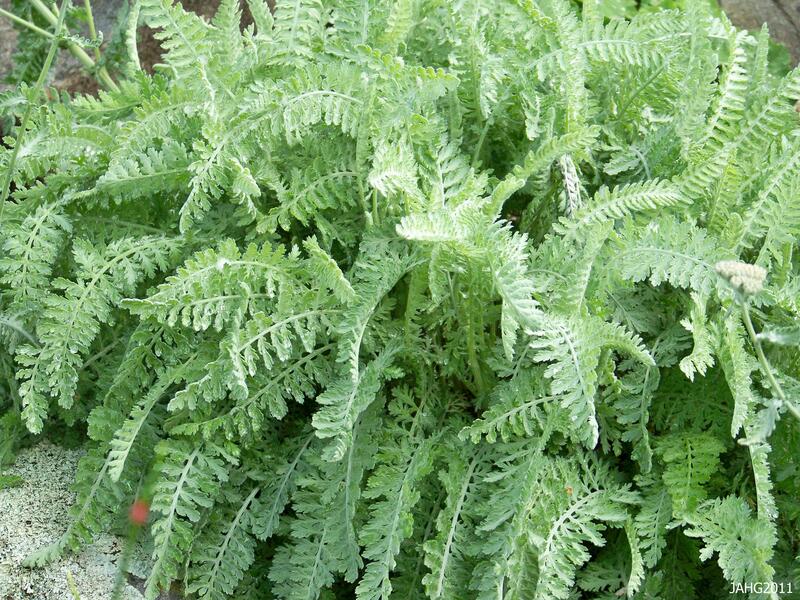 Use this plant in any hot border, such as that with Lavender and Sages. Let the yellows and purples play together with the silver foliage to create a classic color combination.It works as an accent, specimen, in borders or containers and massed. It attracts butterflies to your garden during the summer. An added bonus is it is both deer and rabbit resistant and drought proof. These "Moonshine' Yarrow have been cut back and are now coming into their second bloom of the summer. Really good post! I agree, most of the time, the flowers are the center of attraction while the foliage seems to be overlooked. Thank you for emphasizing the need to take note of the beauty of the foliage itself. I believe coronation gold is Achillea filipendulina. It’s leaves seem to be more coarse than millefolium. Do you know any ID specs that could differentiate them? ‘Coronation Gold’ has leaves which are more of a sage green and less silver. It is also much taller around 1.2 m.(4ft.) here. You are right ‘Coronation Gold’ is a seed selection of filipendulina, as is the selection ‘Gold Plate’ and I have grown all 3 types. All are good garden plants.